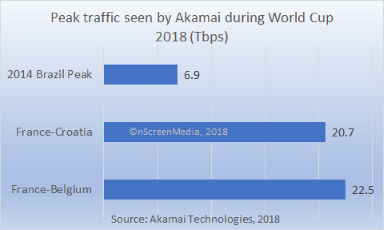 The World Cup was the most streamed event in Akamai Technologies history, driving a greater volume of data in 11 days than the entire Rio Olympics in 2016. 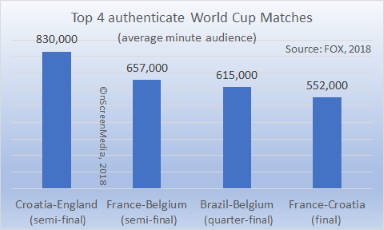 The highest traffic peak was reached not in the final, but the semi-final between France and Belgium. The game reached a peak of 22.52 Tbps[ii], exceeding the final’s peak of 20.66 Tbps and the peak of 6.88 Tbps set in the Brazil World Cup. The whole tournament far exceeded the 2014 World Cup. 9-in-10 games drove peak bandwidth numbers that exceeded the peak game in Brazil. The average (median) peak bandwidth per game in Russia was 10.54 Tbps, more than triple the average of 3.29 Tbps in Brazil. 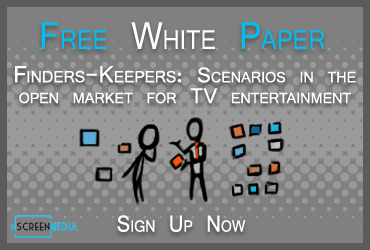 Akamai supported 55 broadcasters around the world in streaming the World Cup. The company delivered a peak of 9.7 million concurrent streams when two group matches between Mexico and Sweden and South Korea and Germany occurred at the same time. 7.9 million streamed the final. [i] A stream play attempt is when a viewer selects play for a video or live stream in an app or web interface. Stream plays is the number of successful stream play attempts. [ii] 22.52 Tbps is 23,610,000 Mbps. The typical HD video stream on Netflix is 2.5-3Mbps.